New Yorkers are a tough crowd. If you offer them a deal, they will go for it. That includes going for a non-green/non-earth friendly deal even though they know better. Just Monday through Friday for $3.10 per week. 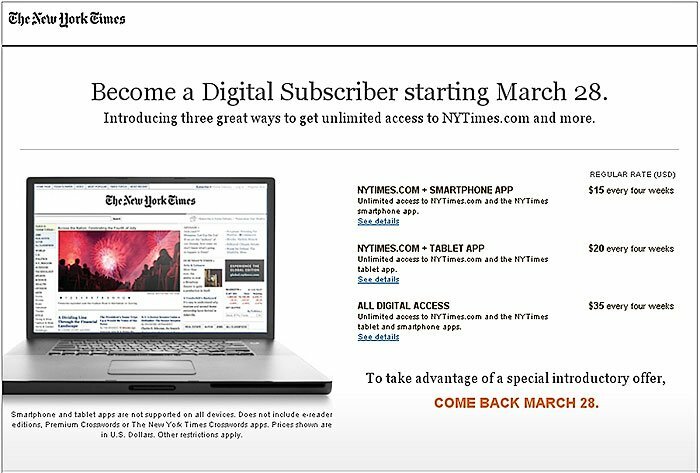 If you subscribe to ANY home delivery, you will get FREE UNLIMITED 24/7 access to NYTimes.com (including web, smartphone app and tablet/reader). These subscription plans mean that you will PAY MORE for the green/earth-friendly digital subscription. Since the home delivery is cheaper AND gives you full 3for access, it is obvious that new digital subscriptions (when combined with the 20 article cap) are just another way to push home delivery. By the way, this new digital subscriptions group is lead by James Dunn, Executive Director at the NY Times who used to be in charge of Consumer Marketing/Home Subscriptions at the Times. Coincidence?? The New York Times proudly proclaims their Environmental Stewardship and Social Responsibility on their website and states, “it is strongly committed to protecting the environment in all of the many communities in which it operates.” However, the new digital subscription plans prove their true motive – to cut down more trees – even though they know better.